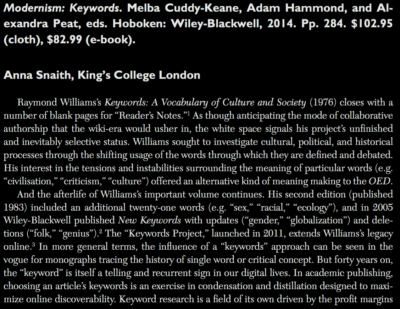 Two years after its first publication, Modernism: Keywords has received its first serious review. To date, the peculiar genre of the book (is it a reference work? a monograph? an edited collection?) has made it a challenge for potential reviewers. We have received some quite disappointing reviews ..